There are three legs to Ecuador’s tourism stool: the Galapagos, the central valley, and the Amazon Jungle region. For the jungle part there has long been a lot of wildlife to see, but slim pickings for a lodge you could reasonably call “luxury” to bed down at each night. That changed when a lodge with two decades of history got a major renovation and opened as La Selva Amazon Jungle Lodge. I got to spend some time there recently to see the upgrades for myself and just posted a new review here. There’s a video that we posted a while back here on the blog, on the trip getting out to this rather remote location. 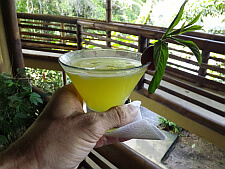 It’s not nearly as trying as trips to some other jungle lodges though: basically you can catch a short flight from Quito around breakfast time and be having a welcome cocktail and lunch a few hours later. You leave the small airport, take a motorboat up the Napo River for two hours, then a short walk, then a canoe ride. Those last two parts are quite pleasant actually and you’ll probably see some wildlife to get you started. One you arrive and sip that welcome drink, you’ll soak in the scenery of a gorgeous lake. The only man-made structures you can see are the ones connected to La Selva. Everything else is just pristine nature. So on many of the excursions you set out on a canoe and watch the wildlife in action. What’s special about this place though, besides the lakeside location, is the comfort you’ll experience in the rooms. These are spacious quarters with a balcony or terrace, with plenty of lounging room and a comfortable bed that has good reading lights. These quarters go well beyond basic nature lodge expectations. The 18 suites are in multiple buildings spaced across the property. They’re a mix of imported niceties (marble tile floors, L’Occitane toiletries) and locally appropriate materials (like bamboo and thatch.) The “Scenic Suites” are quite large, with balconies that have a water view and another sitting area inside. 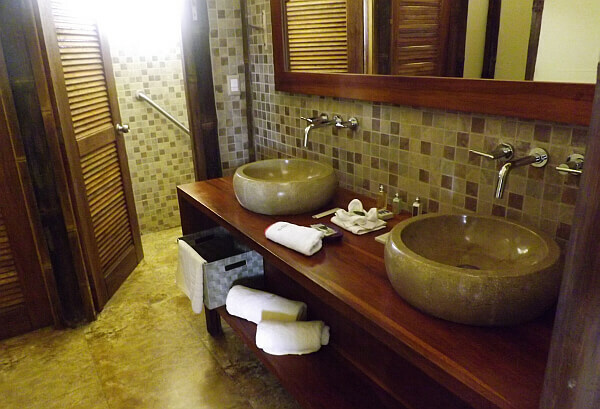 The Superior Suites are similar but have less of a view, while the three Family Suites add more space to the bathrooms, a hot tub on the porch or deck, and a hammock. The other reason to choose this option over others in the region is the cuisine. The freelance guides like working here better than at other places they’ve experienced because the food is better and healthier at La Selva. Despite the long distance from civilization, the chef concocts interesting items to put on a buffet for breakfast and provides interesting (and attractively presented) dishes at other meals. The spacious open dining room and bar have great views of the lake, with a telescope for zooming in on what’s moving. 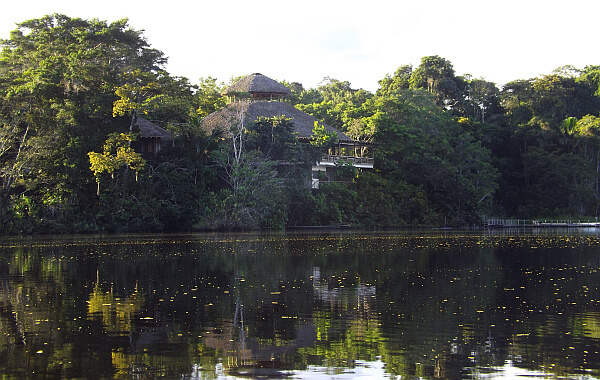 See our full review of La Selva Amazon Ecolodge and Spa.